When Spring comes around you will see brighter colors in fashion and in the home. 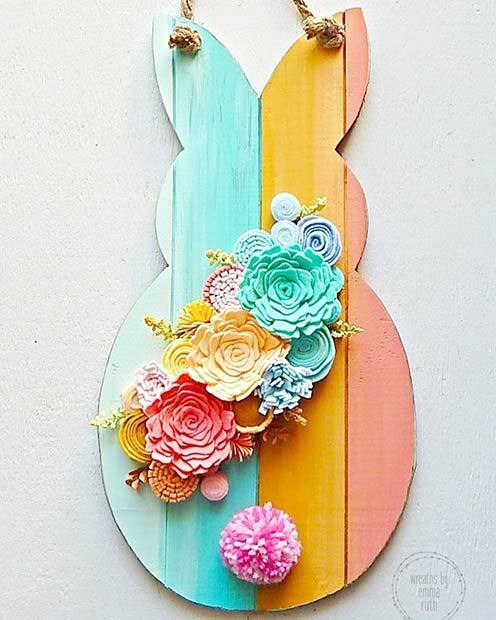 Our next Easter decor idea features a wooden rabbit that shows how pretty these colors can be. The rabbit has been painted in pastel stripes and has been decorated in vibrant flowers. Something like this would suit any room and it will be a fresh and colorful update. Painted jars are very popular. We love jars because you can paint them for any season or occasion and it can be a great way to recycle. 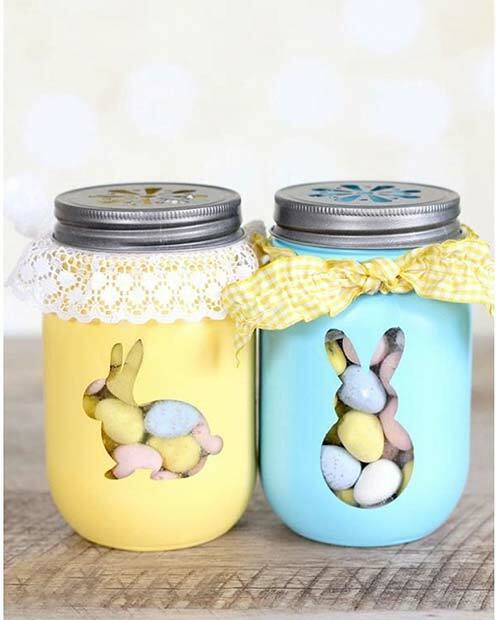 These jars have been painted with an Easter theme, pastel colors have been used with a rabbit design. You could recreate these with any jar around your home. Daffodils will instantly make a room like ready for Easter and the Spring. You can put them in a vase or in a bottle like the one featured. A bottle will give the flowers a rustic look. 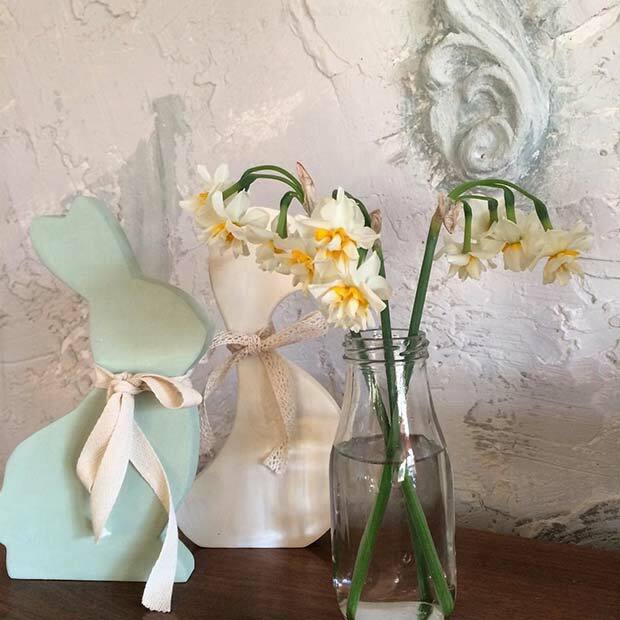 Put your flowers on display with some little rabbits or eggs to finish off your Easter decor. Next, we have another beautiful wreath idea. 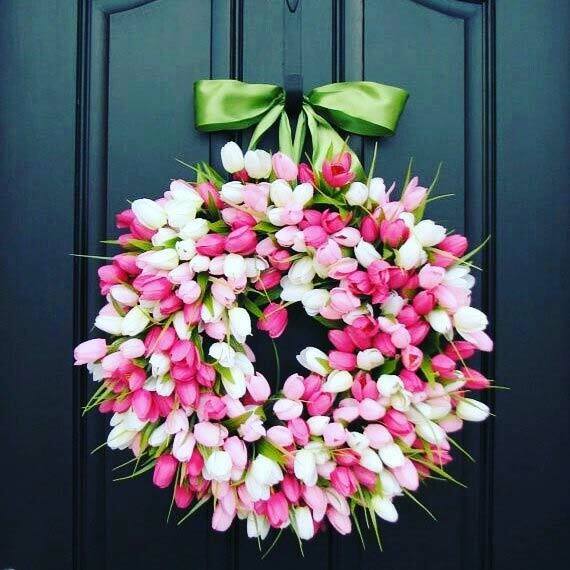 This wreath is full of beautiful tulips and is hung by a green ribbon. A wreath like this is perfect for the Spring season and Easter. You could have a wreath like this or you could have a wreath full of daffodils. It doesn’t have to be just flowers either you could add in some Easter ribbons or eggs. You could buy a wreath or make one yourself. Banners are great decor ideas for special occasions. 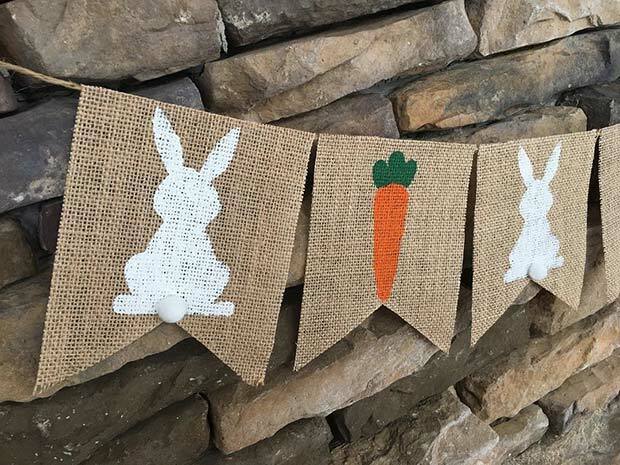 Here we have an Easter inspired burlap banner. This would look great as decoration if you are hosting a dinner or having an egg hunt. You could hang a banner anywhere. If you like crafts and DIY you could create your own banner. Maybe add in some Easter fabrics on the banner to. 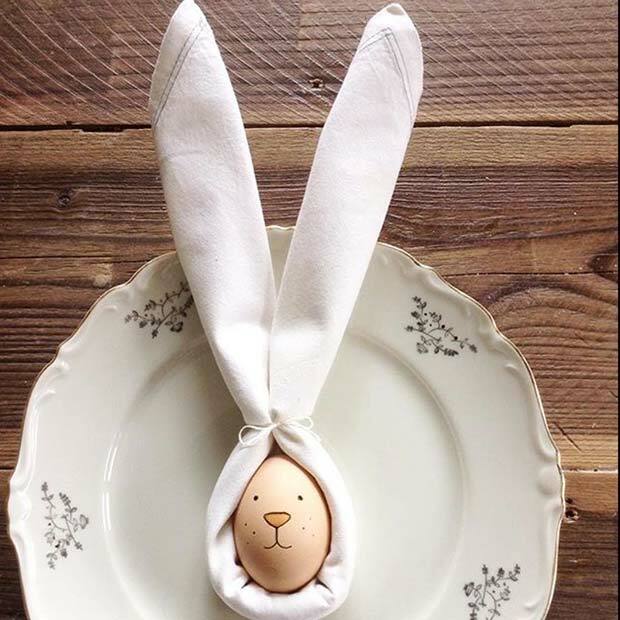 Our next Easter decor idea is so simple and cute! Here we have an egg that has been painted to look like a rabbit’s face with a napkin wrapped around it to look like rabbit’s ears. These are easy to make and would be a pretty decoration for any dinner table. 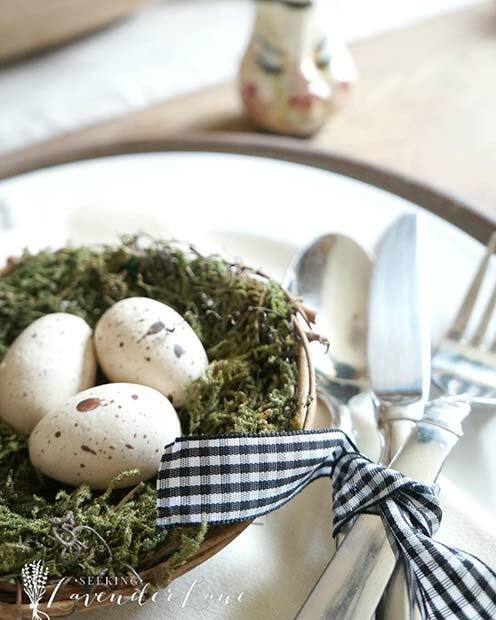 A must-have decoration for Easter is a nest of eggs. You can put a nest anywhere in your home. There are plenty available to buy online but you could buy the nest and paint your own Easter eggs to put in it. 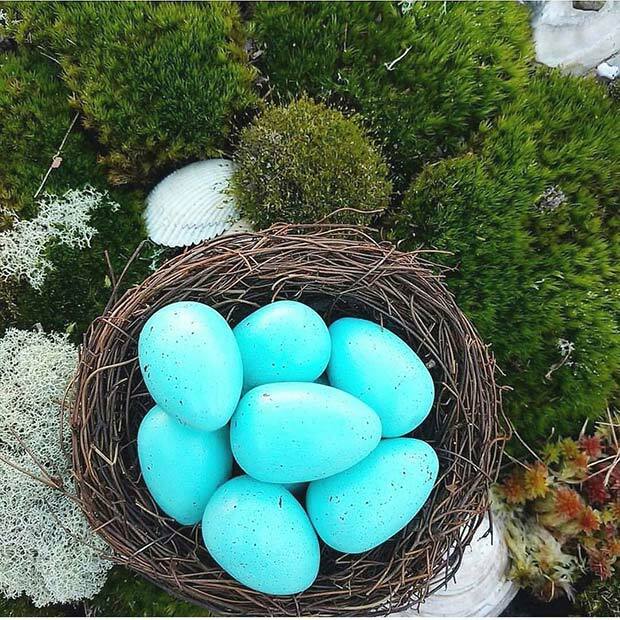 You could also use a nest like this for an Easter egg hunt. We love this simple but pretty idea. Next, we have a cute and stylish Easter decor idea. Here is a print of a rabbit with the message Happy Easter. 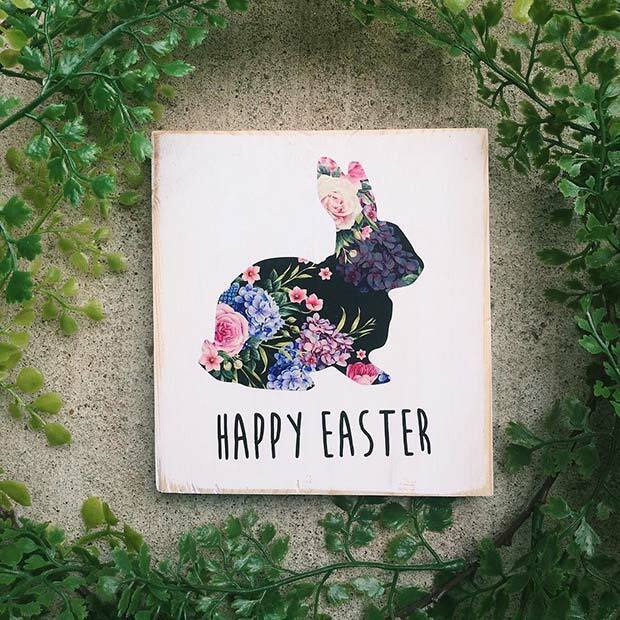 We love how the rabbit is decorated with a floral print and it makes the picture look perfect for Spring and Easter, but it is trendy to. Something like this could be used as a decoration year after year. Earlier in the post we featured a nest of eggs. For our next idea we want to show how cute a mini nest of eggs can look! The small nest has been used as a dinner table decoration. A nest has been placed with the knives and forks. If you are hosting a dinner and are expecting a lot of family or friends, you could turn these little nests into table place card holders. It will make the table look extra special and everyone will know where to sit. Do you like putting artwork on the walls? Then consider a pretty painting like this for Easter. 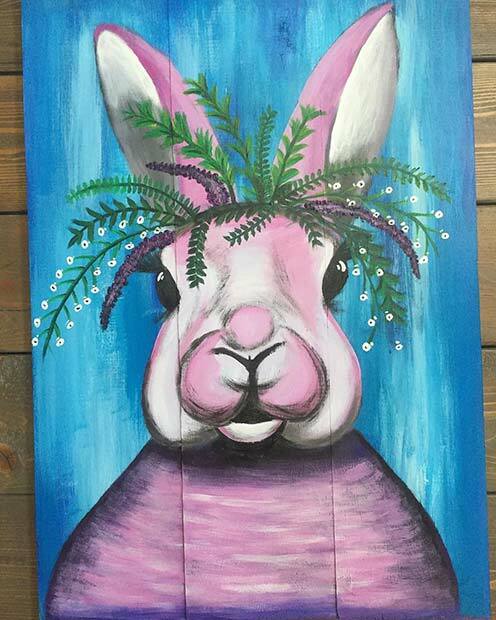 The painting is of a cute rabbit wearing a floral crown. A painting like this is unique and colorful. It will add a pop of color to any room. If you are creative and artistic, have a go at painting one yourself! The country kitchen style and rustic pieces are on trend and very popular. Our next idea shows how you can bring this look into your Easter decor. 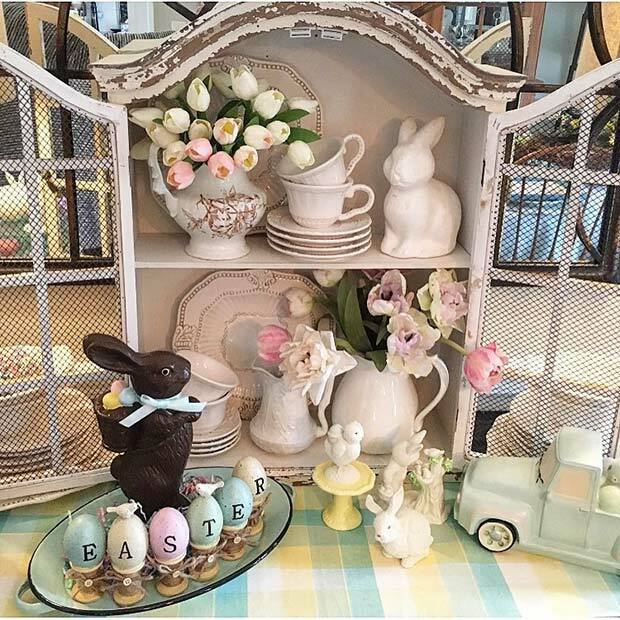 The key pieces for this style are white rabbits, tea pots, jugs and pastel color eggs. You could add in some chicks and light flowers to. The image featured is a great source of inspiration. 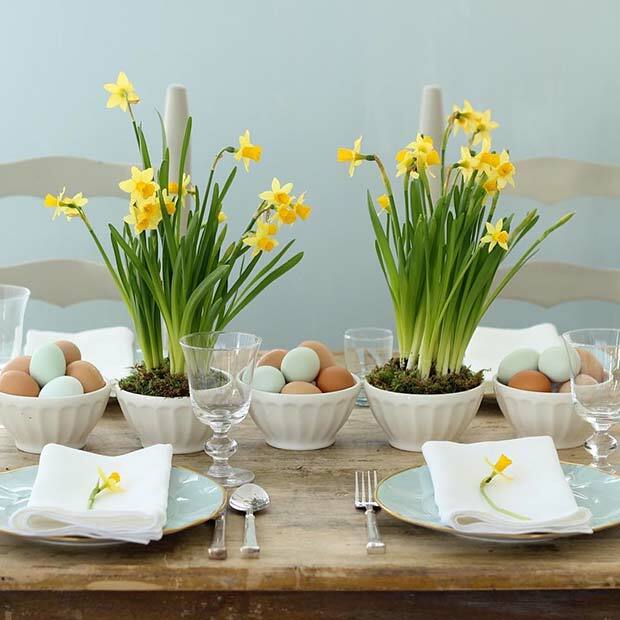 We have mentioned eggs and daffodils as decor ideas this next image shows that both work together beautifully. Here we have a table with daffodils in vases with bowls of eggs. It is a simple but stylish look. A table like this would be perfect for Easter breakfast or for a special dinner. 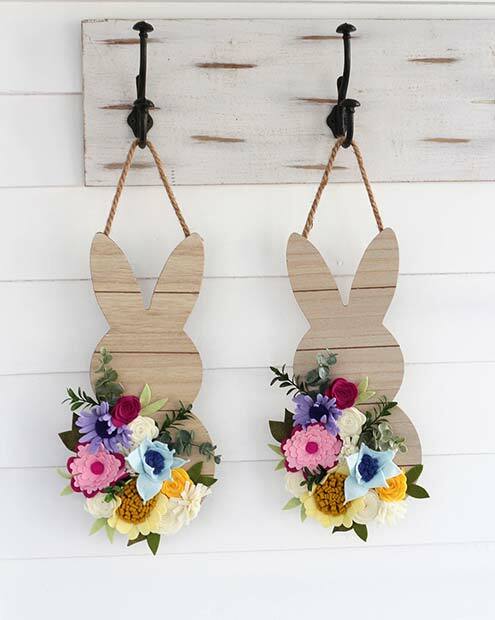 Our next Easter decor idea features cute wooden rabbits that can be hung up. The rabbits would look cute plain, but these have been decorated with beautiful flowers. You can buy rabbits like these or you could make something similar yourself. Wooden decorations will suit any room. Next, we have a stunning flower arrangement to show you. There are three separate pieces that make one big arrangement. 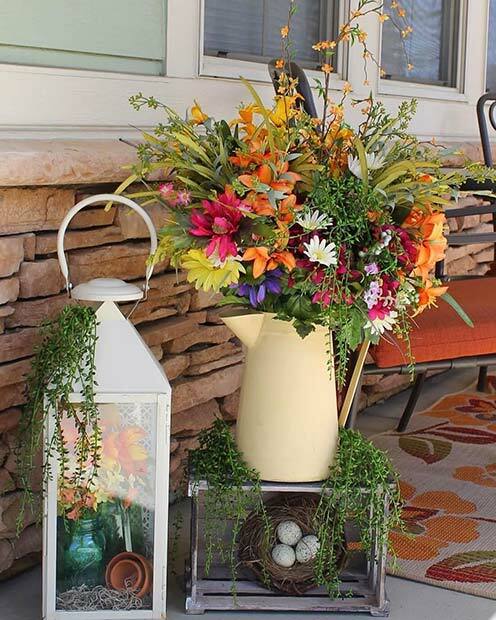 It has everything vibrant flowers, Easter eggs and a rustic jug and lamp. You could create something similar or take smaller elements from it. The jug and flowers would look stunning in any kitchen. Our last idea is this adorable rabbit wreath. 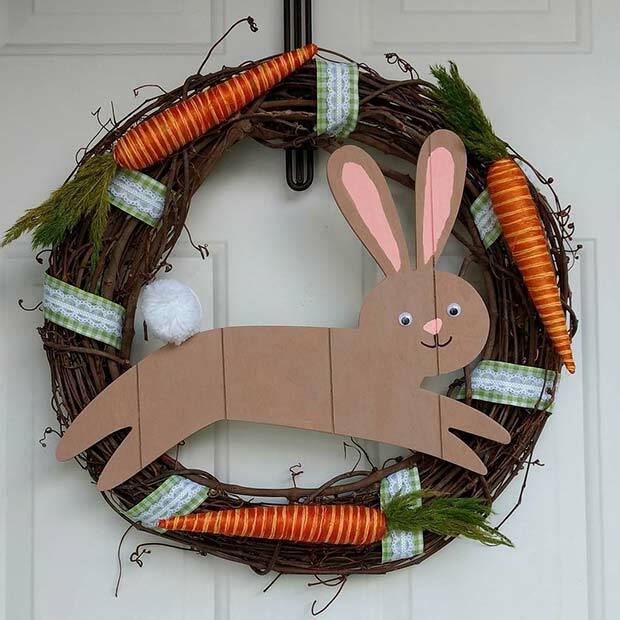 The natural wreath has been decorated with an Easter rabbit and carrots. You could make something like this yourself and add in some eggs and flowers. A cute wreath like this will suit any door. 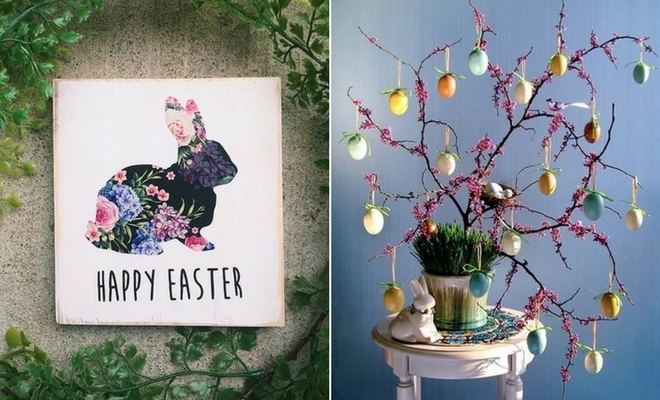 We hope you have found some pretty Easter decor ideas!